IT BEGAN when the Sonstrust supporters bus was involved in an accident on the way to Dunfermline — no fault of the driver — and ended with a 5-1 thrashing by rampant Athletic. A crowd of 3,329 saw Dumbarton blown away by the Pars, and in particular four goal man of the match Nicky Clark. The home side started confidently, and Stevie Aitken's men somewhat hesitantly, on a grey, cold day. On six minutes the Pars went ahead. Kallum Higginbotham put in Michael Moffat, who crossed for Nicky Clark to head home from close range. 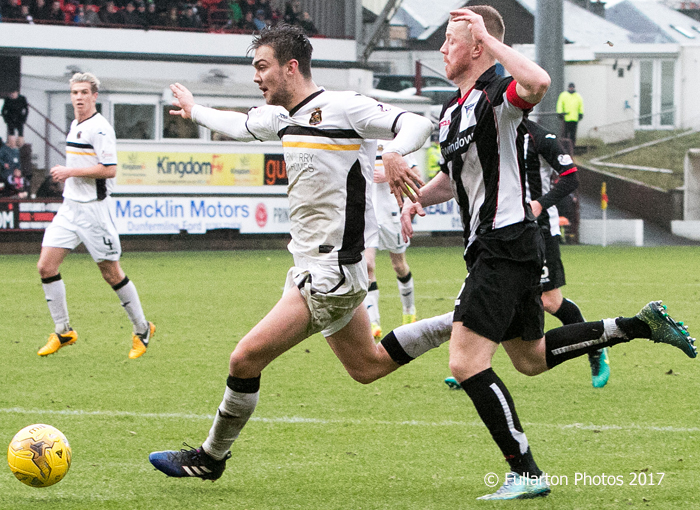 The Dunfermline attacks kept coming as the half progressed, with only occasional forays forward by Dumbarton and no real threat until later on. On 26 minutes Sons keeper Alan Martin made a vital save to deny Clark again, when the Pars striker had burst through to go one-on-one. Immediately afterwards Dunfermline extended their lead to two goals,as Paul McMulllan struck home a superb curling shot which Martin could only get an outstretched finger-tip to. Right at the end of the half, after Stuart Carswell was replaced by Sam Stanton following an incident with Mark Docherty, both Robert Thomson and Andy Stirling came close to pulling a goal back. Sons started the second half purposefully, but the Pars looked dangerous on the break. That point was confirmed when they added a third goal on the hour, as Clark ghosted into the penalty box and headed in off the bar. With ten minutes remaining Dunfermline deepened Sons misery when woeful defending gifted Nicky Clark a simple headed hat-trick to make it 4-0. He added a fourth on 86 minutes with a low drive. Daniel Harvie claimed a well-worked late consolation goal (pictured) set up by Garry Fleming shortly before time added on.